If you aren’t already a compulsive record keeper, Bento 3 may turn you into one. Bento is a simple database application designed for people who wouldn’t normally go anywhere near something called a database. Which is to say that if you want to keep track of just about anything and you don’t want to slog through a lot of technical jargon, you’ll find Bento useful and refreshingly easy to learn. The icon for Bento 3 is a box divided into compartments. Bento boxes are common in Japanese restaurants. They’re basically trays with a compartment for rice, another for your vegetable, another for chicken, and so forth. A place for everything and everything in its place. The application applies that metaphor to information that you enter, which I’ll explain further in a moment. 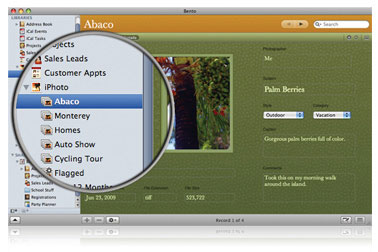 Bento 3 is a product of FileMaker, which is owned by Apple. Apple puts a lot of energy into making things simple, and often succeeds. Because it’s an Apple product, Bento 3 automatically imports information from applications that are native to Apple computers. Your Address Book, photos from iPhoto and iCal events, are brought in automatically and placed in Libraries. Libraries contain what the application calls Collections. Think of Collections as different views of the information in your Libraries. Here’s an example of what you can easily do with Bento 3: I set up a Library for my tax information. The tax folder contains what Bento 3 calls a Collection, but it’s easier for me to think of Collections as subfolders. The Library is basically one big folder that contains other folders where the information is broken down into various categories, just like the public library in your town. You have a building and it contains many books, but the books are separated into collections; one for children’s books, another for travel books, one for biographies, another for photography books, and so on. My tax folder is basically a big library building. One room in the library contains a Collection (or folder) for income, another Collection is called donations, with another for medical payments, another for interest earned, another for interest paid out, another for motor vehicle expenses, and so on. You decide what kind of information you want to place in each Collection (subfolder) and Bento 3 makes it simple to arrange. These collections appear as icons in the left side of the Bento window. You click on Donations and your list of donations appears in the window on the right. The same holds true for Motor Vehicle Expenses and any other Collection or folder you create. All database applications enable users to enter information in what are called fields. When you fill out an application for anything, whether it’s a driver’s license or a credit card, all of the information is separated into spaces called fields. Your first name goes in one field, your last name in another, your street address in another, etc. When designing a database in Bento 3, you create the fields. Bento 3 makes it simple. You get to choose from several different types of fields. One field may hold only text (a doctor’s name, for example), so you select Text Field. The next field may be a date. If you select Date Field, Bento 3 puts a little calendar icon to the right of the field so you can select the proper date. The next field may be a number. You can select Number Field and then select the option that identifies the number as currency. The end result of this simple database is a doctor’s name, the date you paid him or her, and the amount you paid. But at the end of the year, you certainly would want to know how much you paid to all doctors, wouldn’t you? You want a total of the Amounts column. Simple. Click on View, Table. Your entries will come up looking like a spreadsheet. Click on the Amount Row. Then go back to the menu bar and click on View again, but this time select Summary Row. A new row appears at the bottom of the form. You’ll also see double arrows next to the Summary Row field. Click on that and you get several choices, including the choice of totaling the figures in the column. Now, every time you add another doctor and another amount, the total at the bottom of the Amount column will automatically update itself to reflect the new amount. Those familiar with Microsoft Excel are now shaking their heads and saying, “But hey, you can do all of that in Excel.” Which is absolutely true, but Bento 3 doesn’t require that you know a thing about Excel. You don’t have to know a thing about formulas, for example. However, if you have a bunch of Excel spreadsheets, you can easily import them into Bento 3 and see your information either in a spreadsheet format or on an attractive form. In Bento, you can view your information on a form that just contains the fields you created (Doctor, Date, Amount) and they’re automatically added to an Excel-like spreadsheet, but you won’t see that spreadsheet unless you want to, in which case you can click on View, Table, or View, split view, which will show the spreadsheet lay-out at the top of your screen and the form at the bottom. It is, unfortunately, much more complicated to read about this process than to actually do it. In fact, you don’t have to design your own database at all if you don’t want to. Bento 3 comes with numerous database templates built-in and ready to use. In addition, Bento 3 users have designed any number of other databases that can be downloaded for free. If you find one that suits your needs, you’re all set. You can customize any of these databases if they don’t quite meet your needs, adding fields you want or deleting those that you don‘t need. You’ll find them here. 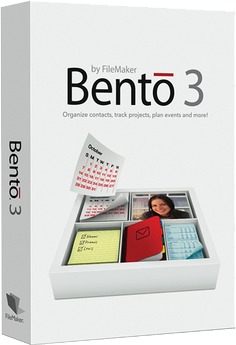 Bento 3 is ideal for storing information and managing all kinds of projects. For example, I frequently write articles about natural and cultural history. The process involves considerable research and in the end I find myself with hundreds of facts or opinions or descriptions. Invariably, someone will come along after a book or booklet has been published and ask me where I found some obscure piece of information. With Bento 3, I can easily keep track of whether I gathered a specific fact from a book (and enter the citation) or an interview with an expert (and then I can list the expert’s name, the date of the interview, and so forth). If someone questions one of my facts after a piece is published, I can go back into the knowledge base I created and do a search and let them know the source of the information. That gets me off the hook for awhile and gives them somebody else to fight with. Bento’s extensive features go well beyond what I’ve described here. If you want to organize your life or your hobbies or you’re just living out in the sticks looking for something to do, try Bento 3. I think you’ll like it. A user manual in pdf format is available online if you want to read about the program’s capabilities, but it’s much easier to get the hang of the thing by using it rather than by reading about it. MyMac rating: 9 out of 10.